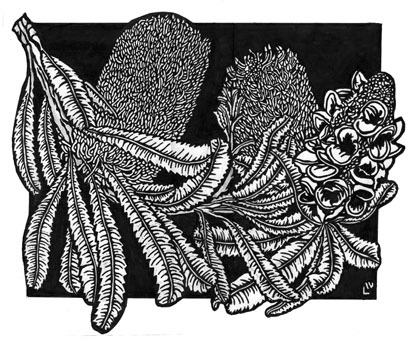 Designing linocuts or any artwork can be a very individual process depending on many factors including the nature of the artist and the media they work in, the style of work and can even come down to the space/time available. Many artists work in a highly intuitive and spontaneous manner, particularly in the contemporary arts practice and produce the most wonderful inspirational work. 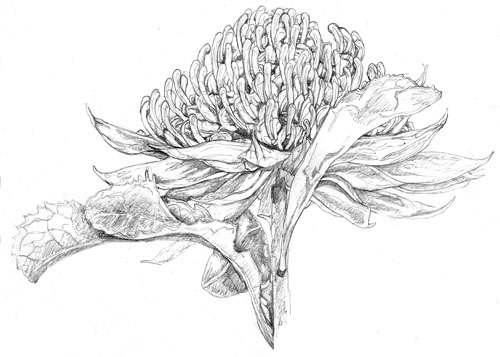 Other artists spend a long time researching background information, drawing individual aspects of the design or idea, sampling colours and producing smaller works either in total or parts of the final artwork. 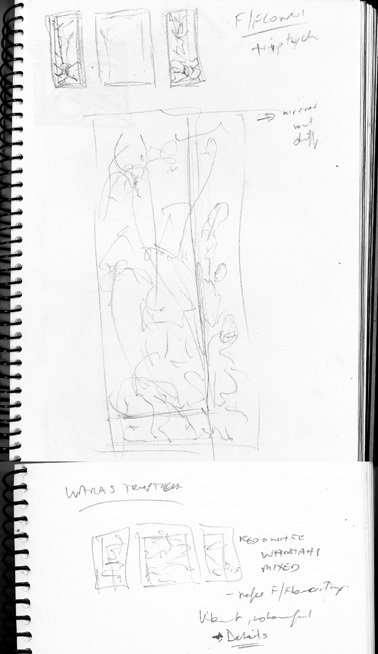 This method has been a time-honoured tradition so that we have artists workbooks/journals/sketchbooks from great artists like Leonardo Da Vinci – it is through these that we can get a better sense of what the artist was thinking and how they went about producing their artworks. It is interesting that in art education in high schools now the “journal” or process is an integral part of the curriculum with students needing to show how they came to the end product – their artwork. 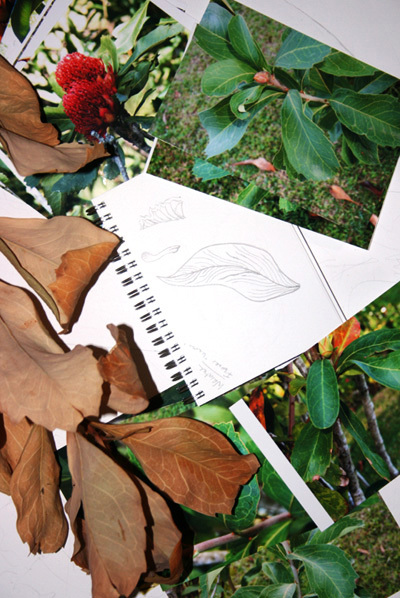 The NSW HSC requires the use of the “artist journal” as part of the marking and assessment processes. 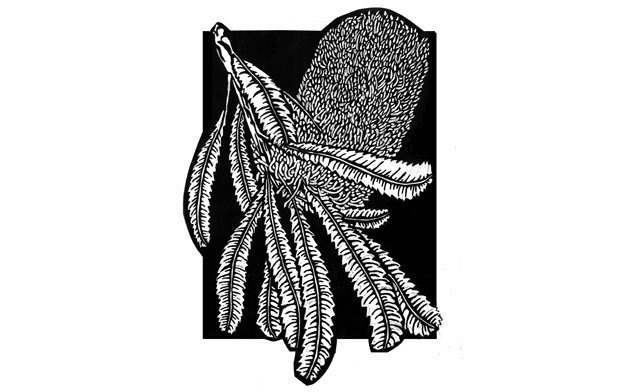 I thought I would work through the process I have used to design the Banksia serrata – Old Man Banksia linocut and the process of its development. 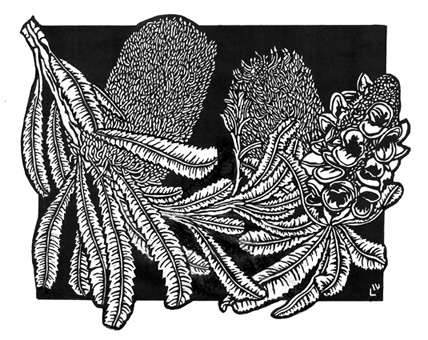 Over some time I had been looking at banksias and in particular Banksia serrata in my garden outside my studio window. 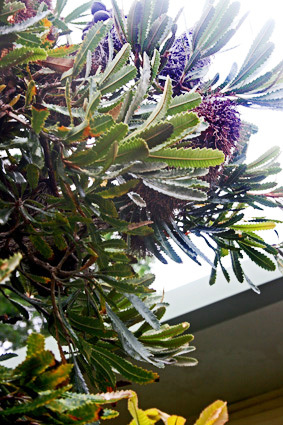 I have been photographing this plant for a while but also looking at design ideas on small scraps of paper etc. 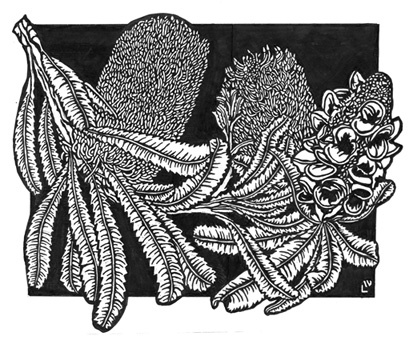 I have used Banksia serrata – Saw Banksia previously for a linocut but this was a very long time ago. 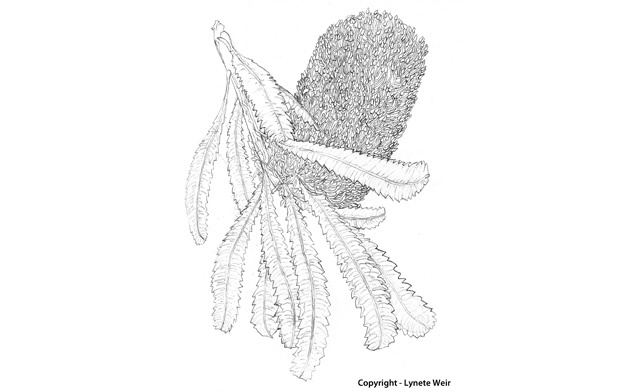 I also completed an illustration and after working from the plant and then photographs I did a drawing of one of the Banksia serrata flowers with their lovely serrated leaves. I love the sweep of leaves down and across. 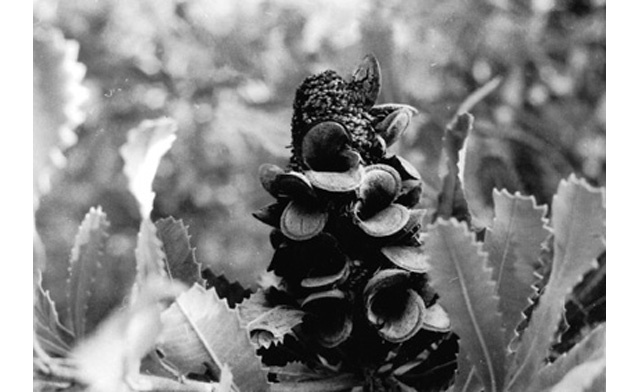 ‘Perhaps I should look at adding to the DESIGNART series‘ with something a bit different – Banksia serrata, seed pod and leaves. 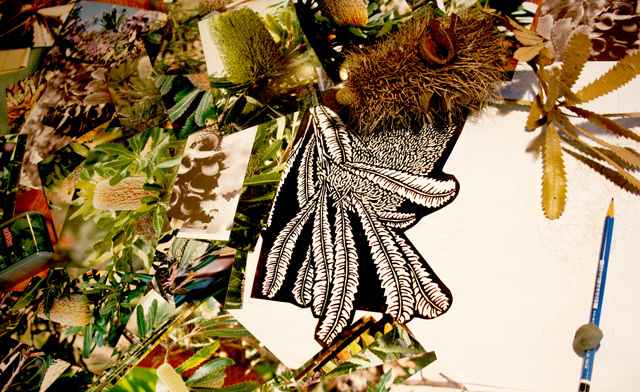 So I started back with my live plant, a dried seed pod, numerous photos, a new template in the DESIGNART range, and a starting point of my one banksia. 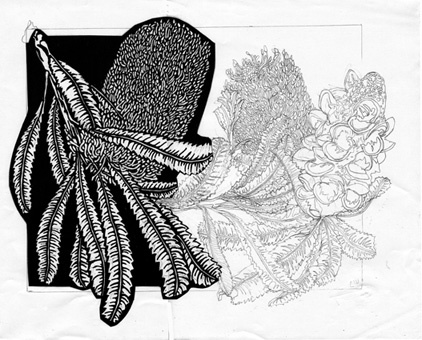 After working through design ideas using a number of photocopies cut up and moving them around and then adding them lightly over the template (size/shape of the basic linocut from the DESIGNART series) I settled on the seedpod over to the right of the template and spilling off. 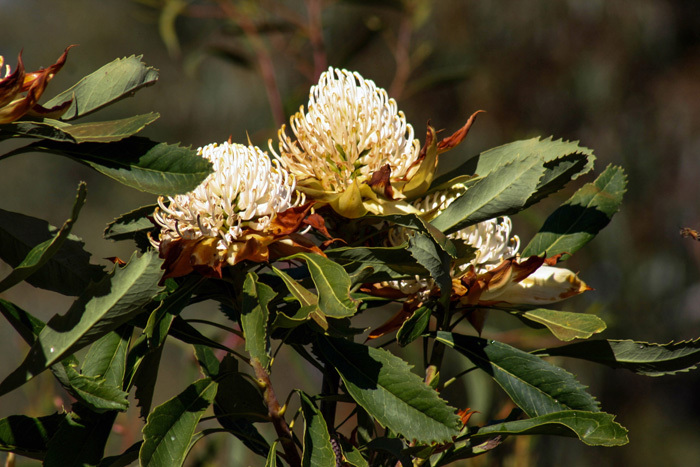 It needed something else so after consulting my plant and photos I decided to add a more ‘ragged’ representation of the flower head after it has opened and is starting to head towards fading from its robust bloom into the ‘softer’ and then wilted phase leading to the seedpods. This is the added on drawing I came up with. 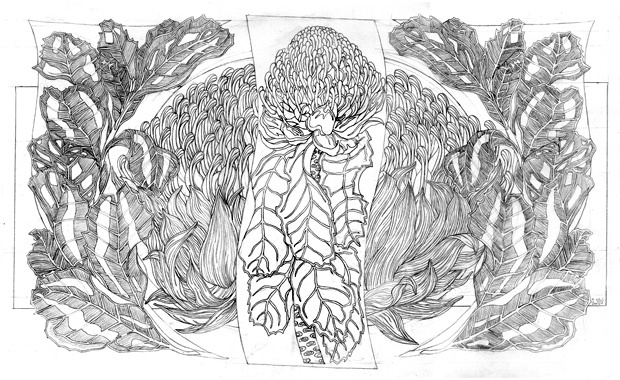 I struggled with the ‘joining’ of the original drawing and the new section – especially as I worked not from the original drawing but the b&w design phase. Trying to get the leaves ‘just right’ was frustrating. 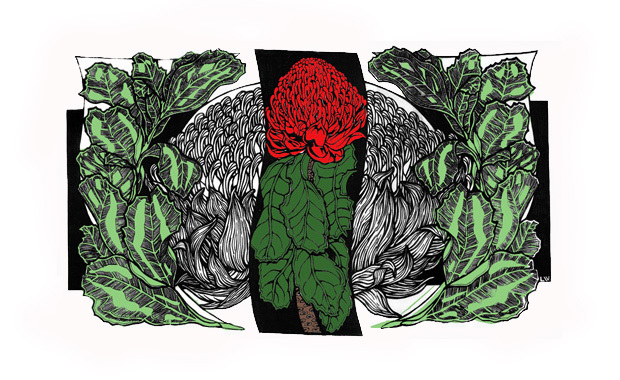 Here is one of the images from my plant that I used where you can see all those new growth leaves all falling out over each other. Eventually I have ended up with 2 images that I have been ‘sitting with’ and deciding which one I will use or which combination I may adjust. I will post more when I start carving. I have actually made a decision. 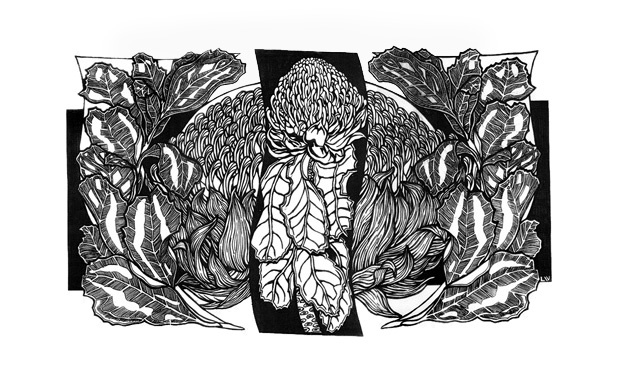 It is a bit like a game of ‘spot the difference’ – note to self : printmakers and artists can be horribly pedantic! Just wondering as an exercise for those inclined to design – what would you do? They say sometimes what goes around comes around. Or perhaps it should be called in this instance the sometimes ‘obsessive’ nature of artists!! After spending ages on the original drawing design – inking it up and then deciding to fiddle around with it to make it just that little bit better – I have took it back to the original drawing design!! Another artist at a workshop I did a few years back said he spent weeks deciding to change the wall colour of his lounge room from a mustard yellow. So after much contemplation, colour charts, mixing etc he repainted the room…and yes it was almost the identical mustard yellow!! So the design is finished – and yes after a week it is back to the original concept!! 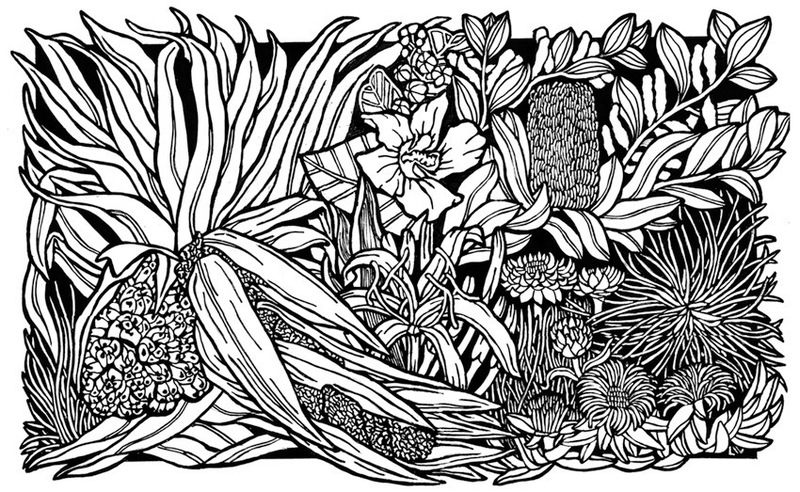 Now for transfer to the lino block, carving, printing and handcolouring – I must admit moving from one process to another actually raises the excitement level. Yes I know a bit boring that at each new step it is seen as ‘exciting’ but I think that is why I like the art processes that I am currently working in and keep coming back to them! I do actually really enjoy each step and it provides interest and hopefully challenge. Even if I sometimes end up back where I started!